The Thule Spherical Travel Transition is a premium, Laborious shell motorcycle go back and forth case with Built-in motorcycle work stand that may be designed to make touring along with your motorcycle easy. The Built-in motorcycle stand included with the case doubles as a convenient motorcycle holder and work stand, making build up and breaking down bikes speedy, convenient, and blank. 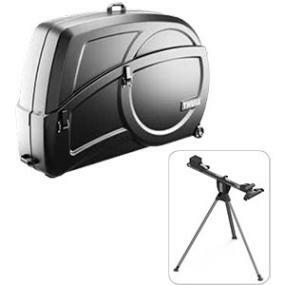 The case includes a rugged polyethene exterior building with foam inner padding to give protection to bikes Right through transit, in addition to two pull handles and Built-in wheels for simple maneuverability. The isolating and protecting nature of the case additionally make it ideal for the long term storage of bicycles.